Half a century has passed since the neighborhood had at least one barbershop on each side of every block. Back when churches were the places people gathered on Sundays, barbershops served that function the rest of the week. People went there not just for a haircut, but also to talk to their neighbors and get the news. 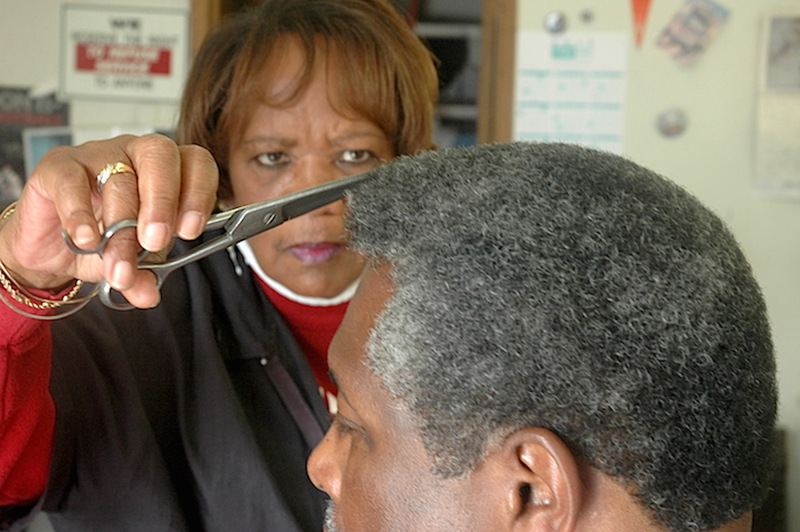 Over the decades, barbershops disappeared, one by one. Among the survivors in the Fillmore were New Chicago Barber Shop and the Esquire Barber Shop. The New Chicago, at 1551 Fillmore, was one of the oldest businesses on the street, finally closing in 2012. The Esquire, at 1826 Geary, remains one of the last local businesses of its kind. Tucked between the Boom Boom Room on one side and Mr. Bling Bling, a maker of teeth grills, on the other, this small traditional establishment continues to be the place, five days a week, for conversation, news, gossip and even the occasional trim. “A barbershop is a social media hub,” says Jon Kevin Green, owner of the Esquire. Since 1968, the shop has served a range of people, from businessmen in suits to the dudes hanging out on the Geary bridge. A second-generation barber, Green remembers the days when gentlemen came to the shop, smoked cigars and discussed philosophy, religion and the weather while getting a haircut. Walking through the shop door now is like stepping back in time. With a stash of magazines and newspapers lying around, an antique chessboard and a Bible in the corner, the Esquire Barber Shop has maintained its traditional character. The steel and leather chairs still have ashtrays, even though smoking is no longer allowed. The major change since the old days, says Green, is that now he employs a female barber, Gail Pace, who formerly worked at New Chicago. Green says there weren’t many female barbers when he was growing up.